The Spanish aircraft accident investigation board CIAIAC published the final report of their investigation into a low fuel incident involving a Ryanair flight at Valencia, Spain in May 2010. Four similar low fuel emergencies in July 2012 were also considered in the investigation. 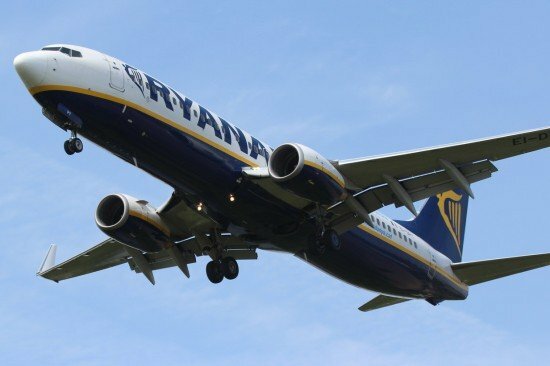 On 14 May 2010, a Ryanair Boeing 737-800 flying from London-Stansted , UK to Alicante, Spain, was forced to make a go-around due to meteorological conditions (windshear). The crew then tried a new approach but the wind conditions were similar and the crew decided to divert to Valencia. They stated urgency (PAN-PAN) due to the fact that they were below the final fuel reserve and then, when they were in approach, they stated emergency (MAYDAY) and carried out an uneventful landing at Valencia. The fuel quantity was checked to be below final reserve fuel. On 26th July 2012 thunderstorms occurred in the vicinity of Madrid Airport that forced ATC to divert twelve flights towards Valencia Airport. Four of these twelve flights declared emergency due to problems with fuel, when they were in approach to Valencia Airport. One was a LAN Chile flight, three were Ryanair flights. The LAN Chile and one Ryanair plane landed with a fuel amount below the final reserve. Given the similarity with the 2010 incident, CIAIAC decided to incorporate them into the ongoing 2010 incident investigation. “The incident was caused by the crew’s inadequate decision-making process in opting to make a second approach, in the choice of alternate airport and in the flight parameters used en route to that airport, which resulted in the fuel amount dropping below the required minimum reserve fuel and in the crew declaring an emergency (MAYDAY). The company’s fuel savings policy, though it complies with the minimum legal requirements, tends to minimize the amount of fuel with which its airplanes operate and leaves none for contingencies below the legal minimums. This contributed to the amount of fuel used being improperly planned and to the amount of fuel onboard dropping below the required final fuel reserve. It is recommended that AENA Air Navigation establish the necessary measures and procedures to facilitate the crews, by means of ATIS, the relevant and significant information that may be associated to sudden changes reported by aircraft, or those not important enough to have originated an SPECI O TREND, this way helping them to prepare their approaches and to take their decisions in the most appropriate way. It is recommended that Ryanair modify its Operational Flight Plan to show the real time and fuel data calculated for any alternate, regardless of its proximity, and the optimum parameters used in said calculations, so that these data may be referenced by its crews. It is recommended that Ryanair revise its Operations Manual to clarify the situations in which to declare urgency and emergency. It is recommended that Ryanair introduce as part of its practices and procedures that, at least when operating outside domestic airspace, and especially in emergency situations, its crews speak English adapted to the so-called “operational level”, using standard phraseology as much as possible and speaking slowly and clearly enough so that they may be easily understood by all of the parties involved. It is recommended that the ICAO clarify and standardize the use of the PAN PAN and MAYDAY terminology in urgency and emergency declarations in Annex 2 (Rules of the Air), Annex 6 (Aircraft Operations) and Annex 10 (Aeronautical Telecommunications) so that the entire aviation community can use common criteria. It is recommended that the ICAO reconsider the text in Section 4.3,7 of Annex 6 resulting from Amendment 36 in terms of both adapting the fuel-related emergency declarations to the generic emergency declarations listed in Annex 2 (Rules of the air) and Annex 10 (aeronautical Telecommunications), and of avoiding having the improper use of the “Minimum Fuel” status become a routine declaration in an effort to obtain better information or preferential treatment from ATC.